Our product range includes a wide range of duloxetine. Duloxetine (116539-59-4) is powder. 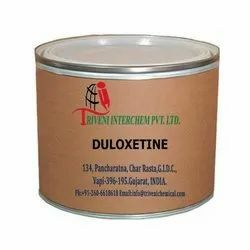 it is use in norepinephrine reuptake inhibitor, serotonin, depressive disorder and generalized anxiety disorder Industry.Duloxetine (116539-59-4) is powder. it is use in norepinephrine reuptake inhibitor, serotonin, depressive disorder and generalized anxiety disorder Industry. Looking for Norepinephrine Reuptake Inhibitor API ?